If you are trying to decide what gift to give (or ask for) this holiday season, consider this list of a few of our farmers favorite things. While our Ohio AgrAbility farmers often have specialized or adapted Assistive Technology, they also use tools and equipment that are designed for ease of use for people of all abilities. LED headlamps are very popular with our farmers and AgrAbility staff (I have one at home that we use for walking the dog in the dark). The light is very bright, and useful for lighting up a dark walk between the house and barn, or to direct the light at what you are working on, eliminating the need to hold a flashlight. Hands free task lighting allows you to light up your work space and keep your hands free for work. This light has a magnet, clip and hook, making it adaptable to almost any type of work environment. If you have back, hip, or shoulder pain, or just spend long days on the tractor, a seat cushion or upgraded seat can help to limit the bumps and jolts you experience while driving your tractor across the field. The Airhawk Plus Seat Cushion is a cost-effective way to upgrade your tractor seat (and you can use the cushion on any of your vehicles). 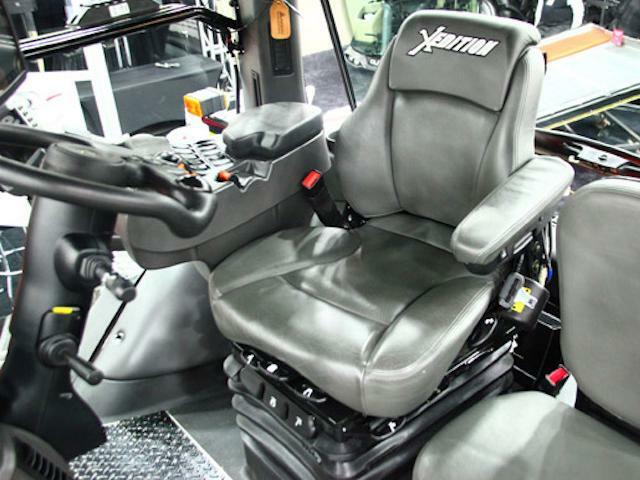 To make a permanent upgrade to your tractor, an air suspension seat will reduce vibration and increase your comfort – it’s hard to work long days with back pain. Camera systems can increase safety, reduce the need to turn your head and look over your shoulder, or to climb in and out of your tractor to hitch equipment. You can choose from one, two or three cameras, and a variety of monitor options. For more information about the benefits of a camera system, read the Ohio AgrAbility in Action article in the February 2018 Ag STAT. An automatic gate opener will safely open the gate when you drive your vehicle slowly up to the gate, bump the gate, and drive through. The the gate will close and latch behind you, and it does not set the livestock free. The Bump n’ Drive manufacturer site states “even smart livestock do not understand the concept of following through”. The Mighty Mule is solar powered and comes with a remote control in case you don’t want to bump the gate with your vehicle. If you have to move heavy objects around your garage or workshop, or lift heavy items, think about getting a lift table cart and save your back and shoulders. One of our Ohio AgrAbility farmers said if his lift table cart ever broke, he would replace it immediately, as it increases his independence, productivity, and reduces his pain after a long day of work. For more information about lift table carts, read the Ohio AgrAbility in Action article in the March 2018 Ag STAT. Several products are discussed in this article, Ohio AgrAbility does not receive any benefit from the vendors whose products are featured, these products are listed as examples, not endorsements.